Abies concolor 'Elkins Weeping' is an irregular upright, spreading or mounding selection of White fir, depending on how a grower stakes or prunes it. It's terminal leaders are very weak and quite flexible when young, so if one desires an upright weeping plant, it must be staked to height; otherwise, it will mound and ramble, but occasionally throw an upright shoot and grow upright for a time before once again knuckling over. Foliage is long, thick, fleshy and Blue in color. One can argue that 'Elkin's Weeping' is one of the most attractive of all weeping firs in existence. 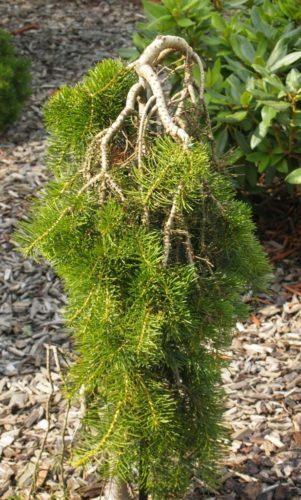 This conifer is fairly robust and will extend terminal branches at a rate of 4 to 6 inches (10 - 15 cm). This cultivar originated as a seedling selected in the 1960s by Harry Elkins of Grosse Pointe, Michigan. Given how desirable this plant is, it needs to be better-known in the nursery trade. Abies concolor 'Elkins Weeping' — a young plant in a private garden in The Netherlands. The new foliage push in spring is green and will harden off to blue throughout the summer.